The house is conceived as three gable-roofed pavilions that provide a threshold between the woodlands and the pastures, taking advantage of two very different scenic panoramas. The one-room deep, central living pavilion contains large expanses of glass along two walls, affording views of both the woods and rolling horse pastures. This configuration insures that the space will be flooded with light at all times of the day throughout the year. A screened porch and bluestone terrace, running the length of the house, provides a stage to view sunsets over the pastures, while a manicured lawn and dry-stacked slate wall provides an ordered transition from the house to the woods beyond. 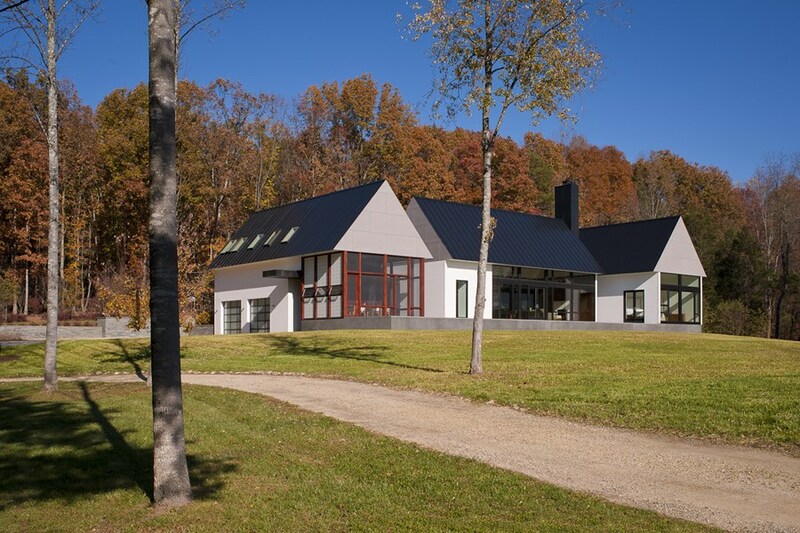 Gable roofs with black standing seam metal, clapboard siding, and the small scale of the separated pavilions evoke a familiar and comfortable rural vernacular, while the large expanses of glass, cement board paneling and crisp, minimal detailing render the house decidedly modern.